1. Shuck corn, rub with oil and place on hot grill. Place whole peppers on grill. Roast corn and peppers on grill, turning every 3-5 minutes until corn is well seared and peppers are blackened and skin is loose. 2. Place peppers in bowl and cover with a tight fitting lid or plastic film. Allow to sweat. Peal charred skin from peppers and discard. 3. Using a paring knife, slice corn off of the cob into serving bowl. Dice roasted peppers, tomatoes and onion and add to bowl. Finely mince garlic and cilantro. Add to bowl along with the lime juice. 4. Stir until well combined. Salt and pepper to taste. 5. Serve with chips, as a topping for tacos, or as a side. Hot peppers come in a variety of colors ranging from green to brown to purple. Native to South America, hot, or chili, peppers also have a diverse flavor profile extending from sweet and mild to fiery hot. To identify a specific pepper’s level of hotness, the Scoville heat chart was developed and is a useful tool to find the right Chili pepper right for you. Our vendors have many familiar and unique varieties to choose from including, jalapenos, banana peppers, bell peppers, Serrano peppers, and unique heirlooms from Flora Bay Farm like Hot Beaver Dam, Tam Jalapeno, Shishito, and Lemon Drop. Nutrition Fun Facts: Chili peppers derive their heat from a phytochemical capsaicin, which is the source of the chili pepper’s heat, is a potent anti-inflammatory agent (1). Capsaicin is a common ingredient in pain-relieving formulas for inflammatory-related conditions, such as rheumatoid arthritis and joint pain (1). That said, hot peppers are in the nightshade family and can cause reactions to those sensitive to nightshades. Chili peppers are a good source of vitamin A and are packed full of vitamin C. Together, these vitamins help protect the eyes and maintain healthy skin tissue. Storage Tips: Wrap unwashed Chili peppers in a paper towel and store in a refrigerator for up to 3 weeks. Peppers, fresh or roasted, can be sliced and frozen to add to meals throughout the winter. Preparation Tips: When handling hot peppers, wear latex or other protective gloves. If you do wind up touching chilies, remember that their oils stay on your skin for a while, so avoid rubbing sensitive skin or touching your eyes. Cut chilies lengthwise working your way around top of the stem. This detaches the stem and removes some of the seeds. Much of the heat in a chili pepper is contained in the seeds, which can be included or excluded from a dish depending on heat tolerance. Hot peppers should be added to the frying pan late towards the end of the cook time so that the capsaicinoids are not released into the air. Roasting green chilis like Anaheims, or Pablanos helps bring out a more earthy flavor. Chilis can be roasted in the oven under the broiler, on the grills, or over an open flame. Roasted chilies can be sliced and frozen and added to soups and chilies all year long. Eggplant come in a variety of shapes, sizes and colors, from traditional oblong purple, to long skinny white or green Asian eggplant. Though not commonly used in American cuisine, eggplant is popular throughout Europe, Asia, and Africa. Because it is less common, many novice, and even experienced cooks, struggle with the bitter flavors and spongy texture that eggplant can take on if not properly cooked. Below are some tips on how to tame the eggplant into delicious meals and some inspiration from abroad on how to prepare! Nutrition fun facts: Eggplant is a good source of dietary fiber, vitamin B1, and copper (1). Eggplant is a member of the nightshade family along with tomatoes, peppers and potatoes. Some claim that nightshades cause inflammation and that reducing nightshade consumption can alleviate symptoms of arthritis and other inflammatory conditions. Preparation tips: Eggplant can be baked, roasted, steamed or grilled. Eggplant is known to have a bitter flavor. To remove some of the bitterness, you can sweat the eggplant by cutting it into desired size and sprinkling with salt. Let salted eggplant sit for 10-30 minutes. This reduces the water content and allows the eggplant to more easily absorb flavors when cooking. Storage tips: Eggplant should be stored uncut and unwashed in a loose plastic bag in the crisper drawer where it will last for a few days in the fridge. 1. To a thick bottomed pan on medium heat, add oil, onions and cook for 3-5 minutes until onions are translucent. 2. Add in garlic, ginger and hot pepper sauté until fragrant. 1-3 minutes. 3. While onion is cooking, combine all spices into small bowl and add to pan. Cook until fragrant, but not brunt. About 1 minute. 4. Add eggplant and stir until coated then add tomatoes and water. Stir until combined. Cook until the eggplant is soft. This will take about 15 minutes. 5. Stir in cilantro and serve warm over rice. 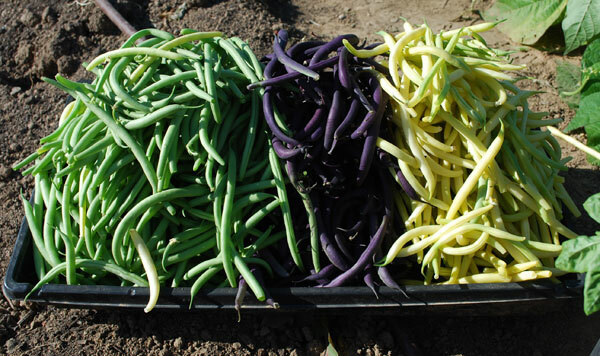 Did you know that 'green' beans come in a variety of colors? Purple, yellow, and even red? It’s a great time to stock up on green beans at the market. Grab a few extra pounds this season and store them away for winter. Green beans are easy to freeze, can and pickle! Check out the recipe below for Pickled Dilly Beans. Preparation Tips: Green beans can be consumed raw, blanched, boiled, pressured cooked, roasted, steamed, stir-fried, stewed, and sautéed. To best retain their nutritional value, cook green beans whole rather than cut (1). Remove the stems, tips and strings prior to cooking. Try sautéing garlic, onion or bacon in a pan with a secure fitting lid. Add green beans, ¼ cup of stock or broth and cover with lid. Allow to steam for 3-7 minutes until tender. Toss with toasted nuts, sautéed mushrooms, or your favorite vinaigrette. For more inspiration, click here. 1. Sterilize 4 (pint) jars with rings and lids and keep hot. Trim green beans to ¼ inch shorter than your jars. 2. In a large saucepan, stir together the vinegar, water and salt. Add garlic and bring to a rolling boil over high heat. In each jar, place 1 sprig of dill and 1/8 teaspoon of red pepper flakes. Pack green beans into the jars so they are standing on their ends. 3.Ladle the boiling brine into the jars, filling to within 1/4 inch of the tops. Discard garlic. Seal jars with lids and rings. Place in a hot water bath so they are covered by 1 inch of water. Simmer but do not boil for 10 minutes to process. Cool to room temperature. Test jars for a good seal by pressing on the center of the lid. It should not move. Refrigerate any jars that do not seal properly. Let pickles ferment for 2 to 3 weeks before eating. Kick off your Independence Day celebration with some locally grown produce from the Community Farmers Market. We will be at CCHS from 8-12 on Saturday with fresh peaches, beautiful slicing tomatoes, sweet corn and all of your other summer favorites. Buying from the farmers market supports American farmers, and local economies. Show your patriotism this holiday by eating local!